One car. One truck. One highway. One big problem! DUEL is the zenith of simplicity, effectiveness, suspense: a trucker, on a whim, goes after a lone car in this chase movie of the decade, if not the millennium. Traffic problems of the ’70’s. We’ve reached an era in moviemaking history where car chases have become passe; the drum solos of movies. Once, they were magnificent – BULLITT, THE FRENCH CONNECTION, MAD MAX THE ROAD WARRIOR – but degenerated into generic padding, much like fist fights. And back in that era when car chases were finding their wheels, a young Steven Spielberg (yes, that guy), with writer Richard Matheson, crafts a movie that was nothing BUT The Car Chase. And blows back our seventies feathered hair! 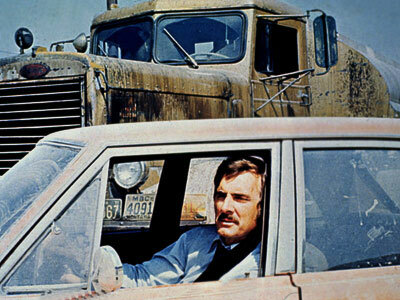 Dennis Weaver (whom we knew from his TV series MCCLOUD – hell, I still think of him as McCloud) is David Mann, a businessman driving home cross country on a lonely highway. He passes an eighteen wheeler tanker truck. And the truck gives chase! That’s the pitch, that’s the movie, that’s the pure animal adrenalin that keeps us on the edge of our seventies waterbeds for ninety minutes. We never see or meet the truck driver; we never know his motivation. The “personality,” the character, is the truck, the angry behemoth trying to run David Mann off the road, kill him if possible. What makes it as terrifying as an animal in the wild is that it cannot be reasoned with – the truck is id, visceral, focused. Pursuer. At one point, Mann even exits his car and approaches the truck, parked in the distance, aiming to have it out man-to-man with the obviously unbalanced trucker. As he nears the 40-foot semi-trailer, that heady terror rises as if he is approaching an irrational beast. He never gets to face the trucker, as the truck pulls away a few feet every time Mann approaches too close. The trucker remains unseen, aloof, unknown. Driving home the point – it is the TRUCK. No cellphones, no social media, Mann has to stop at a highway gas station to use the phone booth – and the truck runs down the public booth! The claustrophobic desperation mounts, as Mann cannot outrun the truck on the straightaways, but then comes upon a long incline where he leaves the truck in his wake. The sheer sustained excitement, tension and thrills would shake us to our seventies bellbottoms, the disturbing music by Billy Goldenberg adding to the uneasiness (often evocative of Jerry Goldsmith in PLANET OF THE APES, 1968). Now it’s known as “Steven Spielberg’s DUEL.” Back then, though it was his first feature film, yet we can see this young director flexing his considerable muscle. He’s got all the angles, all the pacing, all the execution that ensures this – ahem – “vehicle” drives over us like a seventies Mack truck. Starring: Dennis Weaver, Jacqueline Scott, Eddie Firestone, Lou Frizzell, Gene Dynarski, Lucille Benson, Tim Herbert, Carey Loftin.